We are honoured to present the first 2 solo exhibitions by Belgian artist Birde Vanheerswynghels and Australian artist Aiden Morse. Working in different mediums they share an interest in creating artificial worlds. What seems to be an observation of reality is actually a composed image from personal impressions. 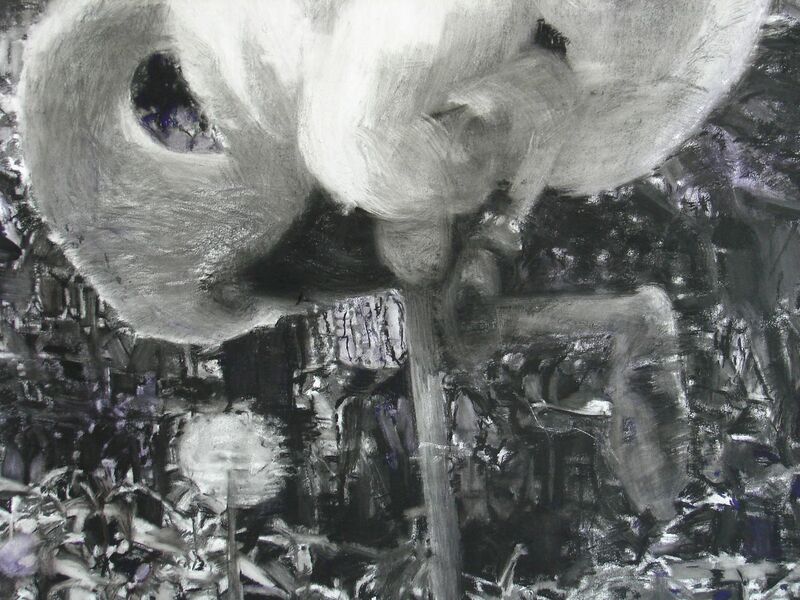 Vanheerswynghels is known for her impressive large scale charcoal drawings of constructed and lush landscapes that stem from a mental archive of images. ‘The cat with nine lives’ refers to Vanheerswynghels’ first insight into how 3-dimensionality can be experienced as 2-dimensionality. As a child she saw a cat getting driven over by a car and got fascinated by the shape the animal transformed into. In her working process she recreates this transit from figuration to abstraction and back again by starting from photographs, mainly self made polaroids. As the foundation for her drawings, these polaroids act as fragments of a composition that becomes a new image. In the exhibition a series of these polaroids is presented, underlining the autonomous force of her photographic work. Considering the process of drawing as an analysis of shapes, Vanheerswynghels often re-uses the same subjects, like trees, bushes, flowers, ponds, plants and birds. In her new series of drawings we see an enhanced adaption of techniques, creating a variety of patterns and contrasts. By using a combination of coloured pastel, charcoal and highlights made by erasing parts of the drawing, the work becomes rich of depth and details. Rendering her subjects enlarged and overly dimensional, the photographic space of the images becomes alienated and the spectator is tricked. The experience of what we see becomes physical. The presence of colour in the charcoal drawings finds its research in a series of large scale pigment prints. A blow-up of a polaroid is covered with layers of pigment creating an object that is in between drawing and photography. As with her charcoal drawings the viewer doesn’t immediately know what he is looking at. The image manifest itself slowly, creating the feeling of a lost or artificial memory. Birde Vanheerswynghels (1986, BE) lives & works in Ghent. In 2015 she was the winner of the Baker Tilly Roelfs Prize, Düsseldorf (DE) for her work in the group show ‘Terra Incognita’, KIT, Düsseldorf (DE). She made several residencies at Cité Internationale des Arts, Paris (GR), Kunstprojektraum Tapir, Berlin (DE), Boiling Point PRESS Berlin (DE) and Takt kunstprojektraum, Berlin (DE). She participated in group exhibitions at amongst others Drawing Center Diepenheim, Diepenhein (NL), Croxhapox, Ghent (BE), Galerie Martin Kudlek, Köln (DE), Voorkamer, Lier (BE).